Henry Johnson served with Thomas Ray Allen during the Civil War. 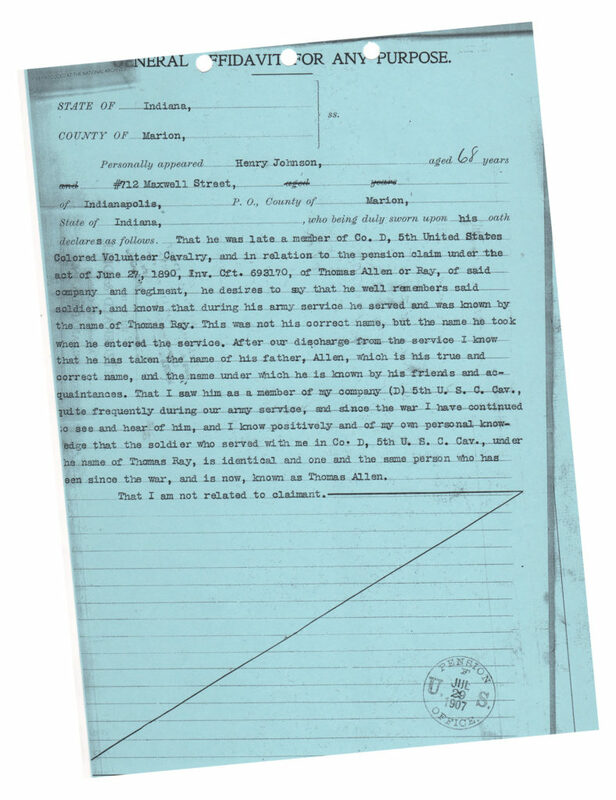 He testified in July 1907 about Thomas’ name change. Johnson was born about 1839 in Adair County, Kentucky. His slave owner was James L. Johnson. Henry Johnson enlisted for three years on August 15, 1964 in Lebanon, Kentucky. He was six feet tall. I believe this is the tallest man I’ve come across in the USCT records so far. His eyes, hair and complexion were described as black. He was 25 years old and his occupation was farmer. He was sent to Camp Nelson near Louisville, Kentucky where the rest of his troop was stationed. In January 1865 he was absent and sick in the hospital in Camp Nelson, KY.
October 1865 to Jan 1866 (Private) On duty, Regimental Band. 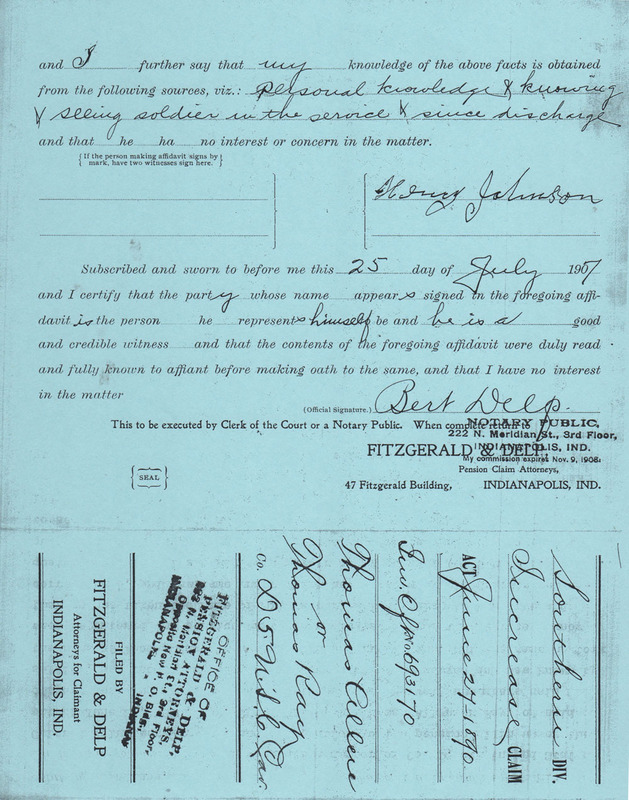 On February 23, 1866 Henry Johnson was appointed Sergent from Private. February 1866 (Sergt) On duty in Regimental Band. He was mustered out in Helena, Arkansas March 16, 1866. He signed with his mark X when he joined the USCT. He was able to sign his name when he gave testimony for Thomas in 1907. There were so many Henry Johnson’s that I was unable to follow him through census and other civilian records. He seems to have been an interesting man and I am sorry I was not able to get to know. more about his life. That’s so weird. How come there were so many men by the same name? Both Henry and Johnson are common names. There are a lot of people with that name. It would be the same with James Smith. Because I don’t have any other identifiers, for instance the name of his wife or the name of his children or parents or siblings, it’s hard to pick him out of the crowd. Yes, and Henry Johnson was one of the older ones at 25. Most seem to be in their late teens. Thomas’s name change certainly produced a wealth of information! I wonder if Henry’s musical talent might provide any leads in following his history after the Civil War. The name change and the fight to get his pension raised makes me wish more of my ancestors had enlisted! My husband suggested the musical tie in for afterwards, but I haven’t yet found any Henry Johnson as musician yet. Lots of laborers, a clerk. This seemed to be an interesting fellow. Enlisted at a later age, served in the band, learned to read & write later in life. Too bad there’s no more information to track him down. I know! And there is only so much time I can take because I is coming up tomorrow. I may look again after the challenge and I will post if I find any new information. Perhaps one of Henry Johnson’s descendants will read this and join the dots. I love the fact Henry learned to sign his name. I’m saddened whenever I come across an ancestor or relative that was unable to do so. It’s great you were able to get so much information about some of his activities from this record. No such luck with my own g-g-grandfather record.